A pair of spacewalking astronauts left the safe confines of the international space station Tuesday and installed equipment for a new line of cargo ships coming off the assembly line next year. But in an unexpected complication, communications with Station commander Gennady Padalka and flight engineer Mike Fincke were cut off from almost a half-hour, reports CBS News space consultant Bill Harwood. Padalka, who is Russian, and American astronaut Fincke floated outdoors in the early-morning hours, taking their third spacewalk in just over a month. This time, they zipped through relatively mundane housekeeping chores, setting up laser reflectors and antennas and swapping out science experiments. At the end of June, the men had to make their way across the entire space station to reach a fried circuit breaker that needed to be replaced on the U.S. side of the orbiting outpost. It took two spacewalks to accomplish the job; a spacesuit problem cut short their first foray. All of Tuesday's tasks were on the Russian side of the 220-mile-high complex, just a short hop from the main exit, making for a much easier endeavor. Padalka and Fincke left the space station empty during their 4½-hour spacewalk. In what is becoming routine, although not preferred, flight controllers in Moscow and Houston kept watch over the vacated outpost. Midway through the excursion, however, communication was lost. At 4:48 a.m., the S-band radio system in the U.S. section of the station shut down. That left the astronauts out of contact with Earth until the station moved into view of Russian ground stations around 5:15 a.m.
A NASA official said the main U.S. radio link was inadvertently turned off by flight controllers in a power-conserving effort involving other equipment, which was prompted by the expected brief shutdown of station steering. Controllers eventually activated the backup radio line, sending commands through Russian ground stations, then got the main system working again. "How long have we been working already?" one of the spacewalkers asked once communication was restored. The reply: about 2½ hours. "You have plenty of time," Mission Control assured the astronauts. Until this year, someone always remained in charge inside during a spacewalk. But the halt in shuttle deliveries in the wake of last year's Columbia disaster reduced the station crew size from three to two. To prepare for the arrival of a European supply ship that has been in the pipeline for years and is running late, Padalka and Fincke hooked up antennas and also removed outdated laser reflectors and put in newer models. The six old reflectors were built in the late 1990s and have been in orbit since 2000, and the new ones will make it easier for the unmanned ships to close in and pull up, NASA officials said. 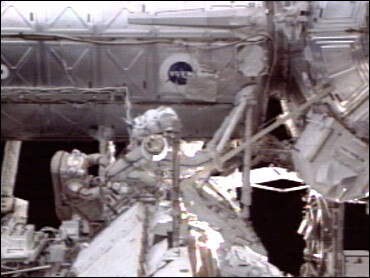 In addition, a TV camera needed for the docking of the new line of supply ships already is broken, and the spacewalkers had to disconnect its electrical cable. The camera will be replaced by a future crew. The European Space Agency's cargo ship — scheduled for a fall 2005 launch — will supplement the U.S. and Russian vessels that fly to the space station. The grounding of NASA's shuttles following the Columbia accident highlighted the need for a more diversified fleet. Padalka and Fincke — more than halfway through a six-month mission — will venture out once more, early next month, again in Russian spacesuits. The U.S. spacesuits on board are unusable because of inadequate cooling; engineers have yet to pinpoint the problem, after more than two months of analysis. CBS News Space Consultant William Harwood has covered America's space program full time for nearly 20 years, focusing on space shuttle operations, planetary exploration and astronomy. Based at the Kennedy Space Center in Florida, Harwood provides up-to-the-minute space reports for CBS News and regularly contributes to Spaceflight Now and The Washington Post.